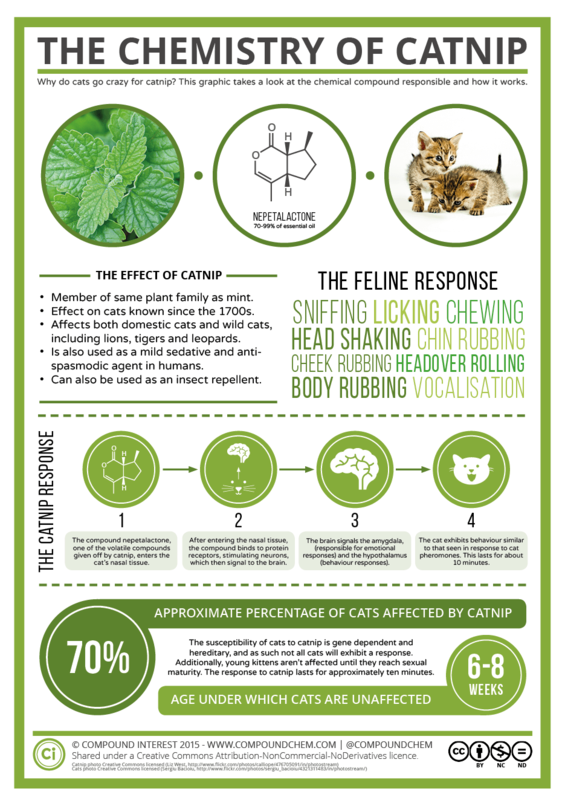 Catnip is the king of cat herbs which are globally known throughout the world due to its use of stimulating cats (source). Catnips are used widely for cat-care industry from making cat pillow or selling fresh leaves, from sniffing or feeding cats. Catnips, in general, affect not all cats but majority and in different ways depending on how are cats and how they consume cat-mint. These writing work combined separate ideas and knowledges and experiences from studies and cat owners to get general view of what catnip can do to cats and furthermore, dig into cats consumption frequency of catmint. Catnip is called Nepeta cataria by scientists, or normally known as cat-mint. The plant belongs to mint family or family Lamiaceae firstly found in areas of Europe, Africa and Asia then lately imported to be grown in America (source). In natural, catnip can reach to 100 centimeter at height and exploited for chemical called Nepetalactone that is the factor provoking cats to be sensitive and get “high”. Catnip is applied in various industries but mainly for cat consumption. People mostly can find catnip contained in some necessities such as pillow, puffer …etc meanwhile, people also find catnip fresh leaves by growing them even for bad gardeners or more convenient, catnips are contained in bags of dried. People also consume catmint as an ingredient of tea for relaxing. Catnip do not only work for cat mind but for people nerve. Through level of sensing the Nepetalactone, scientists has divided reactions into four degrees: from very common behaviors of sniffing or chewing to whole body changes. In particular, cats will sense the catmint firstly by sniffing, which may lead cats to lick and try eating the plant, this phase is already considered stimulation because the more cats crush plant, the more Nepetalactone is vented. Next level of being stimulated is chin and cheek rubbing, head-over rolling and body running are the strongest excitements. To generate these phenomenon, Nepetalactone has been through sensations of cats steps by steps to activate behavior neutron of cat’s brain. Briefly, the chemical released enter via cats’ nose, and from nasal channel, the scent tie up certain receptors, commonly, rouse sensory cells in brain for further stimuli. The front brain, where sensing processes are analyzed, will be in charge of tacking scent. Special Nepetalactone excite some regions of brain where behavioral and emotional responses to stimuli are under control, amygdala and hypothalamus. The responses of these regions come out, as people can see, overexcitement and instant rubbing of head and body dependently. According to scientific studies, not all cats get interested in catmint, the number will fall in about 50 to 75 %, and they are not classified by kinds or genders. Cat’s behaviors to catmints are mostly generic inherited like humans are passed hobbies and habits from ancestors. Some cats do not even react a little bit to catnip at any circumstances, but some will be over affected. Moreover, Nepetalactone only work with biologically mature cats, that mean under six or eight weeks, kittens may be immune to catnip. For the length of effects, catnip work in about ten minutes at any level of stimuli. After that, cats will be under recovering period of about one hour when they would not be longer affected by that plant any long longer. Because of not every cat interest in catnip and the reaction varies in genes so there are many way of behaviors we can notice from them. If cats do not enjoy catnip, they will walk away to find another toy. People can see clear and decisive ignorance from their action. If it happens, however many times you try, they will not get stimulated. If cats are attracted by Nepetalactone produced from scent of mint, they will be exposed to the plant. Normally, they will rub leaves or things containing catmint in order to vent more stimuli. If stuffs are leaves or something eatable, cats will lick or chew, then reaction will raise as it could be. In some case, catnips are used to manufacture cat toys such as pillow or carpet, in front of unable-to-eat stuffs, cats doing only thing is rubbing or crumbling to release more and more scent. Cats will specially enjoy playing with those toys. Catnip belongs to mint family, a kind of herb so referring from its natural origin, catnip promises not to harm your cats. In speak of pros, catnip stimulate cats brain and behaviors in slight and harm-free way, make your cats relaxing and free in mind, at some point, body or head rubbing after excitement may help cats exercise. However, too much is not always good. Eating too much catnip may affect cat digestion, which can be signaled by vomiting or headache due to too strong scent. Strong and long absorption of scent will motivate aggression inside cats, actions of rubbing seems to be normal at first then may become abnormal and out of control. People has imported catnip through continents for consumption. They use catnip to produce not only tea for people but toys and foods for cats. These catnip products come to real life as a stimulation for cat relief and relaxing therapy. By containing itself unique chemical Nepetalactone, catnips affect cats from touch to whole body reaction. However, cat owners need to know that not all cats get excited by catmints or related products and only cats reaching sexual maturity may be affected. The process of catnip effects to cats describe different level of excitement and activities of cats going through four stages along with procedures of processing scent form nasal entrance to specific brain regions. Cat owners also should consider about dosage and frequency of consuming catnip, or it could be unhealthy to cats.